Desperate to catch the last of the holiday season, Apple has announced a formal launch of its AirPods – wireless Bluetooth headphones. Unfortunately, shipping time on current online orders shows a delivery estimate of 6 weeks – definitely not a Christmas gift for this year. On a positive note, the AirPods coming to stores next week “will receive regular AirPod shipments,” according to the press release. So it might be a better idea to wait until next week if you have plans to gift them for Christmas. The AirPods are available this week online and next week in stores and select carriers at the previously indicated price of $159, which includes the charging case. The compatibility requirement for devices is the latest versions of iOS, watchOS 3 and macOS Sierra. 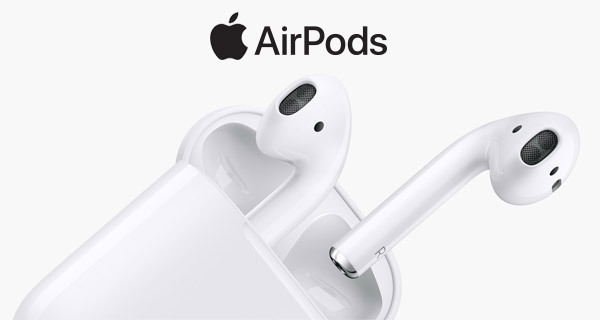 AirPods provide a unique experience to Apple users looking for a high quality wireless audio experience. Though there was speculation that Apple hadn’t yet cracked the problem of syncing the Bluetooth signal going to each individual earpiece, they seem to have overcome that hurdle much quicker than expected. The AirPods are very simple to set up. Simply open the case near your phone (Bluetooth on) and with a simple tap the devices will be paired. Special sensors know when you’ve got them on and when you’ve taken them off, and will automatically pause and resume audio playback accordingly. Apple suggests that the battery power on the AirPods will last a full 5 hours thanks to the new ultra-low power Apple W1 chip, but we propose that this will depend on various usage factors. The charging case holds enough power to give you a total of 24 hours of listening time before you have to charge the unit again. Double-tap the AirPods and you have access to Siri as well. Apple has launched the AirPods in over 100 countries as of this week, with in-store stock likely to be available starting Monday. As of now, shipping time for online orders shows 6 weeks, so don’t expect to get them before the end of January 2017 in case you haven’t already ordered them.